Hi, my name is Brie, and I’m a Ruinous Empathizer. “What’s that,” you may ask? It’s a term from Radical Candor that articulates my “too nice” approach to collaborating with others (including when I worked with clients). For this reason, as I moved into my role of Director of Client Services in the spring of 2017, I was most nervous about how I’d perform as a manager. To ensure I didn’t fall completely on my face, I got to work on my own education, shifting from devouring everything about marketing strategy and what’s on the horizon (though I still do that a bit too) to diving into all things management and leadership-related. Like my boss, Chris Duprey, I have been focusing on reading to expand my mind and gain a new perspective on myself and how I come across to others. As I searched for the right books for the kind of help I needed, I stumbled upon Radical Candor, by Kim Scott. Before I go into what a Ruinous Empathizer is, let me recap the premise of the book for you so you can follow along. Tune into MarketHer on 2/28 for an interview with Kim Scott! Find previous episodes and subscribe here. I’m not going to lie; I started and deleted my summary of Radical Candor about five times. Rather than try to re-do what’s already been said, the synopsis provided by the book does a pretty good job. “From the time we learn to speak, we’re told that if you don’t have anything nice to say, don’t say anything at all. When you become a manager, it’s your job to say it–and your obligation. ‘Radical Candor’ is a simple idea: to be a good boss, you have to Care Personally at the same time that you Challenge Directly. When you challenge without caring it’s obnoxious aggression; when you care without challenging it’s ruinous empathy. When you do neither it’s manipulative insincerity. Obnoxious Aggression™ is what happens when you challenge but don’t care. It’s praise that doesn’t feel sincere or criticism that isn’t delivered kindly. Ruinous Empathy™ is what happens when you care but don’t challenge. It’s praise that isn’t specific enough to help the person understand what was good or criticism that is sugar-coated and unclear. Manipulative Insincerity™ is what happens when you neither care nor challenge. It’s praise that is non-specific and insincere or criticism that is neither clear nor kind. 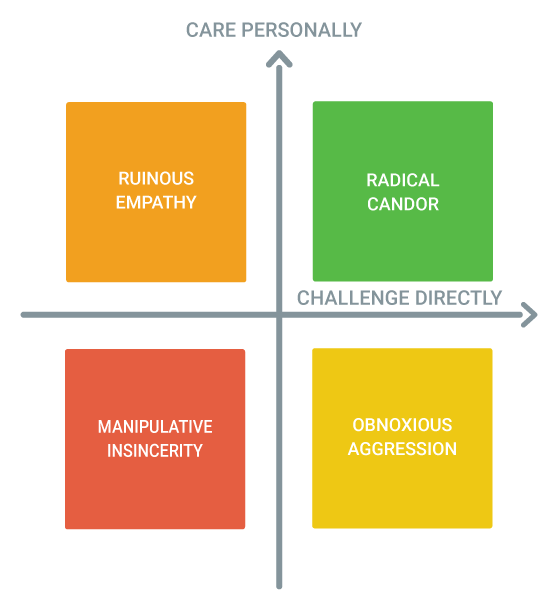 Radical Candor™ is when you have a healthy mix of the two. Consider this scenario to understand the differences between each type. Your co-worker’s fly is down. The radically candid approach is the most effective, right? When you’re radically candid, you provide the guidance your team needs to improve, both on a personal level and a professional level. I’m a true Texan, and grew up with the mantra, “If you don’t have anything nice to say, don’t say anything at all.” Kim Scott, however, disagrees. Being radically candid may mean what you say is not always nice, but it is the most kind, and that’s what you have to keep in mind. The book is jam-packed with concepts and practical exercises you can do to become more radically candid. I won’t go into any of that here (I wouldn’t do it any justice), but below are 3 concepts that really resonated with me. We’ve talked about ambition in previous MarketHer episodes, but I wasn’t able to truly express my views on it until I read Radical Candor. Note: Did I mention we’re interviewing Kim Scott on MarketHer on 2/28? Tune in and find previous episodes and subscribe here. When we think about the growth of our team, do we only reward those who want to go in management? Those who are super aggressive with their growth? What about the team members who are content? Do we judge them for not growing fast enough? We’ve been working on our career paths internally and this constantly comes up. On a more micro level, it comes up when we go into each one-on-one and discuss the future. In Radical Candor, Kim Scott discusses the concept of Superstars vs. Rockstars. You need both in your company to be successful. Neither one is better than the other, and people can move between the two depending on what’s going on in their lives. When you understand that, and they know you do, you are able to be radically candid. They know you care personally. When I hear that phrase, I think of rolling up my sleeves and getting to work, but that’s not it at all. One of the (many) things I’ve done wrong since moving into my director role is approach it with the mindset that I need to help everyone and do the work myself. Granted this was well-intentioned, but still wrong. As I transitioned to my role, rather than manage everyone at once, I focused on improving our strategy products. I loved doing this and came up with some pretty cool stuff, BUT it’s seven months later and they’re still wavering to get off the ground. By building products and processes in a silo (made even worse by the fact I’m remote and literally by myself), I missed clear opportunities to involve my team – those who are on the front line with wonderful perspective. Because I didn’t involve them, it became an uphill battle to get everything off the ground. This could have totally been avoided. Now, I could be frustrated with everyone else, or I could be realistic and look at why this really happened. I now know that if I had followed the GSD model from Radical Candor, things would have probably been very different. Persuade: Since not everyone was involved in the listen-clarify-debate-decide stages, you have to effectively communicate why it was decided and why it’s a good idea. Learn: Learn from the results, whether or not you did the right thing, and start the whole process over again. I admit this is where I’m focusing on the most right now. We have a lot of exciting things going on at IMPACT, but with change comes new decisions, and I need to create a healthy GSD cadence for my team (better yet, empower them to do so). It’s hard. The last takeaway I’ll mention is Kim Scott’s advice to stay centered. “You can’t give a damn about others if you don’t give a damn about yourself.” — I was horrible at this. I worked too late and would decide to order pizza. I’d be tired the next morning, so I’d skip the gym. I’d wake up so close to my first meeting, I might as well have rolled out of bed and sat up at my computer. I took this advice to heart though. I know this “putting myself last” routine was not healthy or good for the long-term, but it’s hard to motivate yourself if it’s just about you. When I reframe how being centered and taking care of myself enables me to fully be present and there for my team, I give a damn. I have a purpose outside of myself. So, I’ve been up at 5:15 am to hit the gym before work, I’ve meal-prepped my weeks, and I don’t beat myself up when I fall short some days. When I take care of myself, I feel good. I’m more productive and most importantly for me, my team feels it. When you feel your best, you can give your team the best. Remember that! If you didn’t know, I am one of the three co-hosts of MarketHer, a video podcast for women in marketing and creative careers. 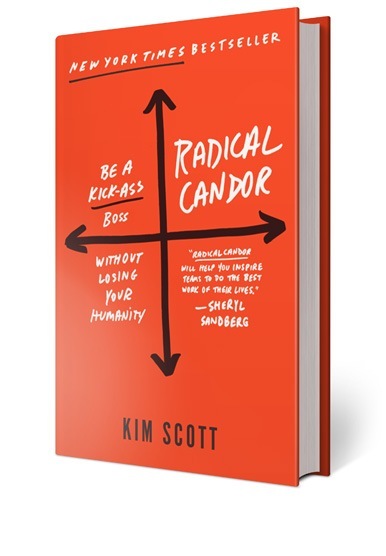 All three of us have been reading Radical Candor, and on a whim, thought it would be neat if we could get Kim Scott on the show. Within an hour, she responded. I know, it’s crazy! So, we’re very excited to interview her on our show airing next Wednesday, February 28th. We are filming 2/21 and fielding audience questions now on our Facebook page.